Instead of chemo yesterday, I had a blood transfusion. My platelet count was too low for me to be treated. At first, I was so disappointed, mostly because this means we’ll be pushing the end date of my treatment out by one week. Then Mari pointed out that I actually just earned another week of summer, a week of feeling good at that. Getting two giants bags of blood added to your system is a very positive thing. A-positive, to be exact. So I got my blood and wow! (Dear vampires, I see what all the fuss is about.) I haven’t felt this good since maybe 2007. I’ll be enjoying an extra week of summer with extra energy and feeling strong. Fabulous. Blessing in disguise. Which reminds me. 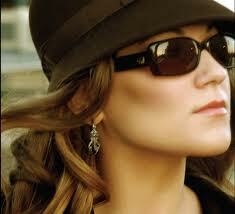 Do you know the story of Melody Gardot? Mari told me this one. At nineteen, Ms. Gardot was hit by a car while cycling. Injuries to her head, spine, and pelvis kept her in a hospital bed for an entire year. Lying on her back. It also left her with hyper-sensitivity to light and sound, so she has to wear sunglasses all the time, even indoors. Melody used music therapy to lift her spirits and to help with the neurological damage that made it difficult for her to speak, think of the right words to say, and remember things. During this time, she started to play the guitar and to sing and write her own songs. Blimey, you’re right. That does look exactly like your old street, Jen. And the first photo reminds me of the decor of our respective dwellings at the time. A remarkable story and an even more remarkable talent. That swish, hip Mari has her finger on the pulse!